After all, it’s discouraging when your chickens turn their nice grass range into a sea of mud. Here’s how to avoid this. It’s discouraging when your chickens turn their nice grass range into a sea of mud. By default, your chickens will destroy all the ground cover in the immediate vicinity of the chicken coop. They do this through a combination of eating the plants, scratching the ground cover with their claws, and covering everything with manure. This process is quite fast in the area around the house, especially in wet weather, when the ground is soft. Even a flock with just a few hens will denude the area right around the chicken coop. Further away, the process is slower. As you add more chickens, the grass is destroyed even faster around the chicken coop, and for a greater distance as well. At really high densities, the only remaining grass, if any, will be far away. At this point, you’ve gone from free-range chicken farming to mud-yard chicken farming. At moderate stocking densities, the manure from free-range hens acts as fertilizer, helping the grass grow. But at high densities, it’s too much, killing the grass instead. So where is this threshold? At a stocking density of 50 hens per acre, the hens will add 2.5 tons of manure per acre per year, equivalent to 106 pounds of nitrogen, 30 pounds of phosphorus, and 61 pounds of potassium. That’s about as much as most chicken yards can absorb unless you go to a lot of extra effort. 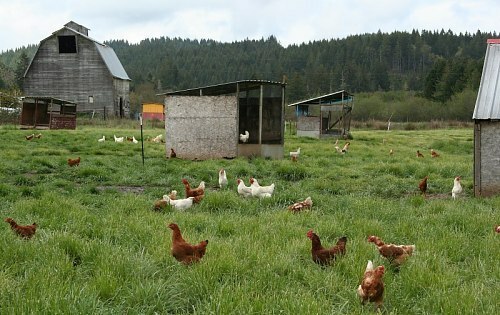 Fifty hens per acre has been considered to be the free-range sweet spot for over 100 years. Here in Oregon, the Experiment Station discovered long ago that chicken manure on range can build up the the points where plants won’t grow. A light, porous soil has a greater capacity for fowls than a heavy soil or a damp soil. At the Oregon Station on clay soil it was found that the day droppings from 200 laying hens on an acre in four years made the soil too rich for the successful growth of cereal crops where cropping the ground was done every other year. The night droppings were put onto other land. If the soil contains too much manure for the crops it is safe to assume that it is not in the best condition for poultry. Sooner or later it is bound to show not only a failure of grain crops but failure of poultry crops. Some people managed to sustain 200 hens per acre by plowing the range frequently and replanting, which buries the surface manure and also aerates the soil, which allows a lot of the nitrogen escape into the air, wasting it and thus lowering it below toxic levels in the soil. That seems like a lot of work to me! One thing that confuses beginning farmers is that you can get away with high stocking densities for a year or two. Everything seems to be working fine. Then the wheels fall off. It takes a while for manure to build up to toxic levels, and the grass in the chicken yard may rally in the spring before dying off again. But overstocking a chicken yard doesn’t just kill off the plant life: pathogens start building up as well. This happens slowly enough that it usually isn’t a problem for your first flock, whose immune systems build up to keep pace, but replacement flocks are hit hard when introduced to this environment. When I did my survey of all the poultry books and magazines over a hundred-year period, one thing that stood out was that people who sang the praises of high stocking density—300, 400, even 1,000 hens per acre—had never been in business more than three years. I’ve heard far too many stories about people who used high stocking densities successfully for a couple of years, only to go broke and have to sell the farm after a series of flock-health disasters. So let’s all be careful out there. Because the chickens will inevitably denude the area around the chicken coop, the traditional solution is to use a portable coop and drag it to a new patch of grass once in a while. Depending on circumstances, the coop might be moved every day or it might be moved just a few times a year. If the chickens are confined to a smaller area, the coop needs to be moved more often. Pasture pens, used mostly for broilers, are floorless chicken coops that serve as both a house and yard in one. These are typically moved to a new patch of grass every day. The broilers aren’t allowed to leave the pens because they can’t be trusted to come in out of the rain (the way hens can), and so it’s best to keep a roof over their heads at all times. We manage our broilers this way. With hens, however, we use outdoor feeders, which are some distance from the chicken coops, and this encourages the hens to wander around quite a bit, spreading them out and requiring less-frequent moves of their hen houses, which we shift by 30 feet or so every couple of months. With portable coops, the grass still takes a beating if the moon and stars don’t align, but because you can move the chickens away from the barren spots, it doesn’t matter much. The bare patches recover after a while. With fixed housing, the area next to the house typically never recovers. If you have fixed housing and more than a few chickens, you’re probably not doing free range, but yarding. With yarding, you have a fenced chicken yard that inevitably becomes barren. Double yards. The chickens are in one yard while you plow and replant the other yard. Usually the yard with the chickens becomes barren before the other yard is ready for them, but the plowing and replanting uses up some of the nutrients from the manure and destroys most of the parasites. The henyard system. A thick layer of straw or other litter is spread over the entire yard, and more (a lot more) is added whenever the yard becomes muddy or nasty. Once a year, the litter is cleared out and spread on a garden or field. This prevents parasite buildup and mud. I describe this on my free range and yarding page. Stoneyards. The yard is covered with a couple of layers of large round stones. The manure tends to wash down below the top layer of stones, separating it (and any parasites it contains) from the chickens. Sun porches. The yard is really a deck elevated well above ground level and is given a wire floor, usually made from welded-wire fencing. Chickens do better on some soils than others. uncultivated lands must not be chosen. To locate on any soil which will not utilize the droppings for the production of green food, is to introduce a loss sufficient to turn success into failure. The ideal soil for poultry is a soil too sandy to produce ordinary farm crops successfully, and hence an inexpensive soil; but because land too sandy to be used for heavy farming is best for poultry, this does not mean that any cheap soil will do. A heavy wet clay soil worth $150 an acre for dairying is worth nothing for poultry. Pure sand is likewise worthless and nothing can be more pitiable than to see poultry confined in yards of wind swept sand, without a spear of anything green within half a mile. The soils that are valuable for early truck are equally valuable for poultry. Sand with a little loam, or very fine sand, if a few green crops are turned under to provide humus, are ideal poultry soils. The Norfolk fine Sand and Norfolk Sandy Loam of the U.S. soil survey, are types of such soil. These soils absorb the droppings readily and are never covered with standing water. The winter snows do not stay on them. Crops will keep greener on them in winter than on clay soils three hundred miles farther south. The disadvantage of such soils is that they lose their fertility by leaching. The same principles that will cause the droppings to disappear from the top of the ground will likewise cause them to be washed down beyond the depths of plant roots. This loss must be guarded against by not going to the extreme in selecting a light soil and may be largely overcome by schemes of running the poultry right among growing crops or by quick rotations. Land sloping to the southward is commonly advised for the purpose of getting the same advantages as are to be had in a sandy soil. In practice the slope of the land cannot be given great prominence, although, other things being equal, one should certainly not disregard this point. In heavy lands it is necessary to raise the floors and grade up around the houses. The quickly drained soil does away with this expense. Timber on the land is a disadvantage. Poultry farming in the woods has not been made a success. It’s the same proposition of the droppings going to waste. I know a man who bought a timbered tract because it was cheap and who scraped up the droppings to sell by the barrel to his neighbor, who used them to fertilize his cabbage patch and in turn sold the poultryman cabbages to feed his hens, at 5 cents a head. Of course, this man failed, as does practically every man who attempts to scrape dropping boards and carry poultry manure around in baskets, instead of using it where it falls. —Milo Hastings, The Dollar Hen, pp. 53-54. But the European Union Says 400 Hens per Acre is Okay! It’s a sad fact of life: Regulations tend to be written by factory farmers who only want the appearance of being old-timey and small-scale. The European Union’s free-range regulations are designed to allow what is, for practical purposes, a high-density confinement operation, because only a few hens actually manage to go outdoors. With low stocking densities, you use more acreage for the same number of hens, and that takes a lot of fencing. See my Chicken Fencing FAQ for information about how to do this without breaking the bank. Broilers have a short lifetime before butchering, typically around 6-8 weeks, while hens are kept for a couple of years. On our farm, we only raise broilers for about eight months out of the year, while we have hens year-round. So what with one thing and another, a broiler places a lighter load on the land over its lifetime than a hen does. By my calculations, you can probably raise 500 broilers per acre per year in daily-move pasture pens without much trouble. How High Should the Grass Be? Tall grass interferes with the chickens’ freedom of movement, so keeping it to around two inches helps. You can do this through mowing or grazing. My impression is that the taller pasture species choke out the shorter ones if given half a chance, so you get a better diversity of pasture plants if you keep things short. If the grass gets too tall, the hens will be restricted to pathways and tunnels through the grass, and the acreage is very underutilized. Which Pasture Plants Should I Sow? Your pasture will eventually reach an equilibrium of wild plants if you keep it mowed and don’t let the chickens destroy it. When planting a bare pasture, a “pasture mix” of grass/clover seeds from your local farm store should be as appropriate as anything. In climates with the right combination of temperature and rainfall, clovers will provide more nutrition than grasses. In my climate (Western Oregon), grasses grow year-round but clovers don’t, so a clover monoculture isn’t in the cards. In other climates, it may pay to plow and replant your chicken pastures to a specific mix or monoculture from time to time. Grass Range or pasture is the natural method of providing green food, and where it is supplied abundantly, is probably the best method. Clover and alfalfa ranges are preferred, primarily because the green stuff is available over a longer period of the year. They do not grow up and become tough and unavailable, as grass does. Frequent mowing of grass, however, will help to keep it tender. For poultry pastures, plants capable of forming a dense, hard-wearing, and lawn-like turf are desirable. Wild white clover and ladino clover are suitable legumes. Grasses suitable for poultry turf are perennial rye grass, meadow grasses, and fescues, creeping bent, and crested dog’s-tail. However, poultry does not like the plants after they have become aged and woody and will then only eat them as a last resort. Turkeys prefer ladino clover, but other grasses can be satisfactorily used for grazing. —G. F. Heuser, Feeding Poultry, p. 239. How Much Nutrition Will Chickens Get from Green Range? “Lots” or “not much,” depending on how you count. In terms of calories, not much. By other measures, lots. Range improves the flavor of chicken meat and eggs. Range improves the nutritional content of chicken meat and eggs remarkably. On the other hand, range provides few calories and unreliable amounts of protein. Cows and horses on the farm wasted a lot of grain, and household garbage was thrown out the back door, allowing a small farm flock to be kept without any feed cost. Modern nutrition hadn’t been invented yet, so even the best-kept flocks weren’t all that productive, allowing badly kept flocks to be competitive. People didn’t mind much if their flocks were half-starved and had high mortality, provided the hens laid some eggs in the spring, when forage is plentiful. If there are only a few chickens on the farm, the hens can hatch enough eggs to perpetuate the flock. These factors made it possible for any farm to produce a few eggs for free, but only for small flocks. Without cows and horses on the farm, even the smallest flock needed store-bought feed much of the year. What Should I Feed My Free-Range Chickens? Pretend that your range doesn’t exist—because, in some seasons, it won’t—and always provide a nutritionally balanced chicken feed. As much as they want to eat. That way, your chickens will never be malnourished. Provide chick feed for chicks, layer feed for hens, broiler feed for meat birds, and so on. You can’t rely on range to provide reliable levels of nutrients year-round, because you haven’t analyzed it and have no actual idea of what your chickens are getting. Besides, the nutritional value of range changes every day, with the progression of the seasons and as your chickens denude some sources while others recover. Chickens will still forage quite a bit even with 24/7 access to a balanced chicken feed. This is even more true if you provide their feed and water outdoors. They’ll eat the nutritional, palatable, yummy forage, avoid the questionable or poisonous plants, and remain in good condition even if the range is bare or covered with snow. Poultry researchers have tested this in every conceivable way over the last hundred years, and the result is always the same: flocks are healthier, more productive, and more profitable if they’re fed a balanced diet. This is true with good range, bad range, and no range. Saving money on chicken feed is best accomplished by offering low-cost feeds, especially whole grains, in addition to a balanced ration. Which feed brands are best? National brands like Purina are reliable. Regional brands can be good, too. Just avoid brands with the word “Country” in the name, because that’s a code word for a low-quality feed aimed at cheapskates. Local mills vary all over the map. Some are excellent, some are terrible. People who turn their noses up at Purina and formulate their own feed often fail, because poultry nutrition is harder than it looks. It was easier in the old days, when high-quality protein supplements like meat-and-bone meal were affordable, but those days are long gone. Constructing something equivalent from largely vegetable sources is complicated. 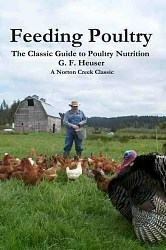 I’ve republished G. F Heuser’s Feeding Poultry, since it has everything you need to know about poultry nutrition. Learning how to tell good-quality ingredients from bad ones, since every ingredient is available in high-quality and low-quality forms. Learning how to formulate chicken rations. I’ve republished G. F. Heuser’s Feeding Poultry, which goes over these issues in detail, and is a must-have for anyone serious about feeding non-prepackaged feeds. Heuser’s book deals with creating balanced feeds without the use of vitamin/mineral premixes. One source of such premixes and reliable advice on how to use them, is Fertrell and their Nutri-Balancer product. See my Feeding Chickens FAQ for more information on poultry nutrition. Will Free Range Save Me Money? No, free range will not save you money. Free range will cost you money. Your chickens are exposed to the elements, and that will lower growth rates and egg production compared to a controlled-environment confinement housing. Your chickens will get some calories from foraging, but the additional exercise means they expend more calories, too. And because they get rained on, they’ll expend more calories keeping warm than chickens who always have a roof over their heads. If you want to save money, read this article. These methods can cut feed costs quite a bit, and can be used in combination with free range. Free range is about quality: product quality and quality of life. If my only options were to raise chickens in confinement, I wouldn’t raise chickens at all. With chickens out on grass range, I like raising chickens. Similarly, my customers would not be very interested in buying eggs from a confinement flock, nor would they taste better than supermarket eggs. So by having free-range chickens, I have a market for my eggs, and one that pays well: two to three times more per dozen than conventional supermarket eggs. For more information about free-range chickens, see my Free Range FAQ page. Just wondered what you think of using metal on tbe side of a coop with a hole cut in. Chickens would fly up and enter coop that way. Predators couldn’t climb up the metal. Would owls go in? Hmmm just wondering. Thanks for this piece of great information. I appreciate it much for my project. Is there any problem grazing goats or sheep within the chicken range to keep the grass short? Are there any diseases chicken may contract from these animals? Thanks for writing! Generally speaking, poultry and four-footed livestock don’t share parasites or diseases, and by eating worms and insect larvae, poultry actually reduce infestations on pastures. At the same time, poultry do best when the grass is pretty short, so the benefit goes in both directions. Back in the old days, 100 years ago, some of the most profitable poultry farms in the country were on cattle ranches around Petaluma, California. The chickens were housed and fed in areas that were fenced to keep the cattle out, but the fences allowed the hens to come and go at will.